I had been using canning jars to hold my cold-brewed coffee, homemade almond milk and coconut milk but I didn't care for the BPA in the lids, so I've been searching for an alternative. These Weck juice jars are perfect! The size is a perfect size for the batches of milk I make, the glass lids with rubber gaskets gives a great air-tight seal, and I love the way they look to boot. They also pour much smoother than the canning jars did. Contrary to another review, I could not find a better price anywhere for a set of 3, and the free Prime shipping made it an even better buy. My only complaint, and it's not even that big of a concern, is that I can't get my hand inside to clean it, but the same is true of standard mouth canning jars, and bottle brushes are cheap. I love these jars - that's why I bought a second set. They are perfect for fresh squeezed juices or cold brew teas.. or anything else you want to keep in them. The seal is airtight and they are dishwasher safe. Love these jars! I will make tea concentrate and keep it in the fridge, then I can make a glass of iced tea whenever I want one. I also use one to make homemade coffee creamer and keep in the fridge. I wash them in the dishwasher and they are sparkling clean for the next use. We use these everyday. Very practical and dishwasher friendly. I love these. I have not canned juice in them. I use them for cold brew coffee after it comes out of the fresh press (and really, that's the best way to make it). Holds a little more than one pot of coffee. for refrigerator storage, you'll what the pop off white lids. You will also want a brush for scrubbing inside due to the narrow neck. Love these to poor juices , milk , Water and teas for family get together and set me out for people to get their drinks . If you buy box wine here is a lot nicer way to put some wine on your table and no bulky boxes of wine . If I were stranded on a desert island this might be one of the few things I dreamed of having. True, it takes a little work to learn the process of canning with these jars, but they are so beautiful. Before Ozfarmer I had to look high and low for them. All of the Rex jars are glass works of art so beautiful that they needn't even be filled with jellies and the likes. I love these! I bought them to use for a mimosa bar at my sister's baby shower last weekend. I had different flavors of juice in each one, and they were the perfect size! Everybody thought they were so cute! I'm also really happy that they came with lids so that I can use them again for other things. They'll come in handy when making dressing, etc. I highly recommend! They're great quality! These are pretty jars and hold just the 30 ounces that are produced in each session by my juicer. That's the positive. They are sized just right. Actually the output of my Omega juicer container is exactly the same as this jar. Joy. I can make a days worth of fresh choose in a right sized container that fits nicely on the shelf in my refrigerator.However, the lid with rubber gaskets and springs are a real bother. My elderly mother can't manage the contraption. The first thing the spring wants to do the moment you press it is fly across your kitchen or down the drain.It they make a press on cap instead of all that, it would be much better.I've had no problem with leakage when traveling with it as designed.The bottle is a little thick and I cannot recommend drinking directly from it but only using it for juice storage. 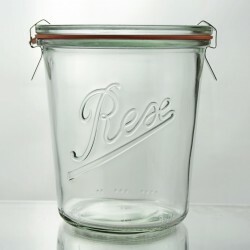 Prepare refreshments of any kind in the typical retro look with the Rex 500ml juice jar. Vigna radiata BFA CertifiedAnnual legume to 60cm. Sow Spring-Summer. Green plant used as green ..